The FPS serves to protect the student’s fees in the event of a PEI (Private Education Institution) being unable to continue operations due to insolvency and/or regulatory closure. It was first launched as the SPS (Student Protection Scheme) initiated by CASETRUST and has been replaced with FPS (Fee Protection Scheme) under EduTrust. 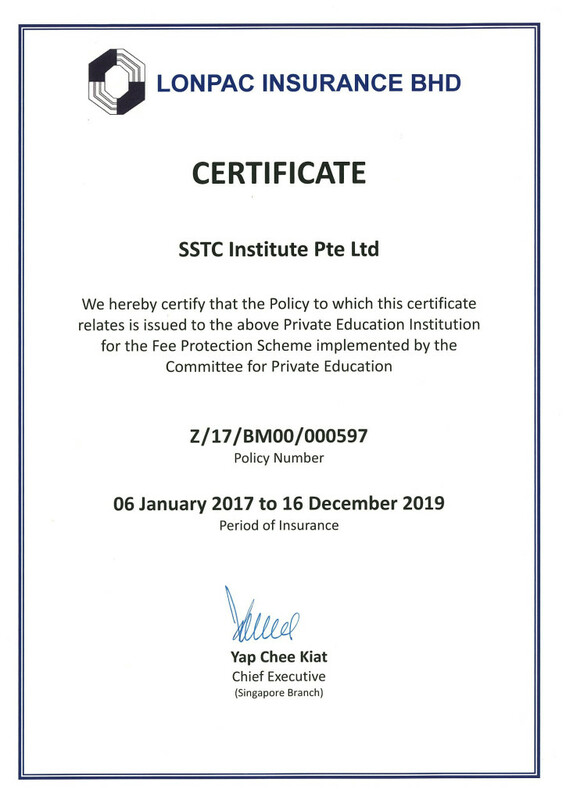 In full compliance with the EduTrust guidelines set by CPE (Committee for Private Education), SSTC provides fee protection for the fees paid by our students in the form of an Insurance Protection Scheme. SSTC’s Fee Protection Scheme (FPS) is applicable to all students who are enrolled in any of our courses (except FPS-waived short courses) and pay FPS fee. Course Fees stipulated in Schedule B in Standard PEI-Student Contract SSTC are covered. Examples of protected fees are Course Fee, Hospitalisation & Surgical Insurance Fee, Registration Fee, Research & Development Fee, Science Lab Fee and Assessment Fee. FPS Insurance will be purchased within 7 working days when the fee is paid in cash, cheque, credit card or NETS. When the fee is paid by e-banking or telegraphs transfer, FPS is to be bought within 7 working days after the payment has been credited into SSTC Institute’s bank account. 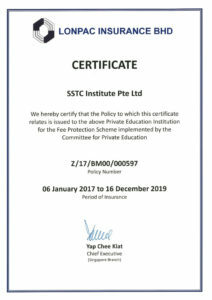 The student will receive a soft copy of the Certificate of Insurance by email from the operating agent of the insurance provider, and a hardcopy of the Certificate from SSTC upon commencement of the course. Loss of ‘Tuition Fees’ by Insured Student due to insolvency or Regulatory Closure of PEI. Failure of PEI to pay Sum Awarded by Singapore Courts to the Insured Student. Death by Accident or Total Permanent Disability by Accident of Insured Student. All claims shall be made on the Insurance Provider’s prescribed forms and submitted to the Insurance Provider as soon as reasonably possible, together with all supporting documents including the original copy of the receipt issued by SSTC and all other required information. Students are advised to check the Insurance Policy Certificate of Student Insurance received from the Insurance Provider for insured amounts and period of insurance.